I have always read historical fiction. When I was a child I associated fiction with times and places far removed from my current suburban routine, from the Little House books to the Great Brain series. As I grew up my fiction continued to be historical. I graduated to the Bronte sisters and Jane Austen. 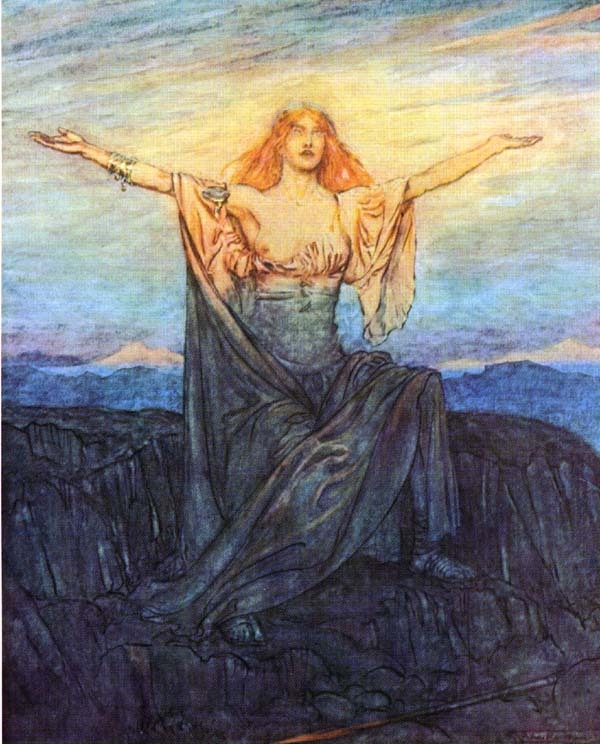 As a teenager I read the Mists of Avalon, which crossed me over from history to fantasy and I took a side path into science fiction. As an adult I became interested in the actual history, and my reading took me all over the world in all times while I enjoyed learning about what people did when it was not the twentieth century. I have been so used to the idea that a story is set long ago or far away that when I began to imagine my own stories it never occurred to me that they would be contemporary. There is not as much excitement in taking a cab as there is in being swept up by a knight on a war charger pounding its way along a dirt path into adventure. I’ve been in a cab. I’ve been on a horse. No contest. I chose the late medieval period for my story about books and knowledge because of the richness of the background of the times. The Turks had captured Constantinople about 50 years before, and the city’s fleeing scholars flooded Europe with the ancient manuscripts they carried away from the carnage. My characters are hunting these books and scrolls. Perfect timing. Because I have had so many years immersed in history, it was not difficult to set my characters there, nor did I struggle to remember what had been invented yet. Anachronisms are a constant challenge, but handy references can prevent embarrassment. The most important reference I have for avoiding them is the Oxford English Dictionary. The OED has extensive etymological information on every word. I use it when I want to mention something, but am not sure if the item or the concept has even entered the vocabulary at the time. Sensitivity to anachronism is vital for an historical author. The readers are smart, and they will find a mistake even editors may miss. In one of my favorite books there is a scene where the castle ladies are out picking fruit…in Scotland in April. In real life they would be lucky to see blossoms on the trees at that time of year. They would never be picking fruit. It is a time-travel story, but not that kind of time. In another book the beautiful heroine is feeling lonely in her castle tower in the 1150’s. She muses at the window and then lays down her sketchbook. Maybe there was a window. Maybe. Though the writer did not elaborate upon the incredible wealth of this heroine’s father. Glass windows existed, but were more commonly seen in cathedrals at that time. Paper was so expensive then that it was equally unlikely that this teenager was given quantities of it for sketching. Small mistakes like these can shake a reader from the imaginary world of the characters and interrupt the flow of the story. What was happening was real in the reader’s mind until they were stunned by an out-of-place sketchbook. It hurts. Even in science fiction, the weirdness of the environment must be explained by the author. Small questions like, “How do they breathe?” and “What do they eat?” can nag at a reader until the author relieves them with an explanation. I try to have my characters breathe and eat and sleep and scratch and grumble about the weather. These small details connect them with readers who also have the occasional itch and hate being cold and wet. Placing light sources within a scene is also a detail I often use to emphasize the time period. In modern times we take light for granted, but before power stations and incandescent bulbs it might not be so easy to read the expression on another’s face, and shadows were prevalent. We don’t see shadows so much anymore. I try to draw the reader into the past with those details they share with the characters, rather than go out of my way to describe the differences. When Nadira is hungry, I hope the reader feels a little urge to go to the fridge. When she is cold, I hope the reader tucks her feet under her on that comfy sofa and pulls her sweater around her shoulders. When Montrose bends down to kiss her, I hope the reader feels the rough stubble on his chin. I know I do. Another tool is language. This is more difficult to achieve. I want the reader to play the story in their imaginations, not stumble over thee and thou. I also want to evoke the time period, so I cannot allow any idiom or slang from other centuries. I choose the dialogue very carefully, keeping in mind that the purpose of the words is to convey information and emotion. Those are the elements of the story; I don’t want so much historical accuracy that I have to insert words that will annoy the reader. One can read a book about Chaucer’s time without having to read it in Middle English. I was pleased when a recent review of The Hermetica of Elysium praised the language. It was an aspect of the book I had worked very hard to create. This reader, at least, had been able to both enjoy the story with ease as well as stay in the medieval atmosphere. This is due partly to my trusty OED, and partly to my own desire to get on with the adventure. How can you know what is “True”? Is there one Truth? The current political drama running on all stations makes me shake my head and turn to philosophy. Truth is subjective. On the other hand, one may argue that if you crash a car into a wall a million times the car will always crumble, therefore it must be an objective truth that moveable and immovable objects do not mix well. But I would postulate that if you ran that car into a wall an infinite number of times, in an infinite number of universes, at least once the wall would crumble and leave the car unscathed. Physicists are wondering if a broken glass could unbreak if given an infinite number of universes. It could happen. A better analogy would be the man who looks out of his house one morning to find there is an earthquake and fire in his city. He believes the Apocalypse has come. He is killed by a falling brick. For him it was the apocalypse. For another man on that same morning 50 miles away. it was a nice day to work in the garden. For the man killed in the disaster, it was the Truth…but it was also a nice day in the garden. As for the broken glass, we see it is not repairable in our lifetimes, or in our universe, so go ahead and buy another one. No one wants to wait for infinity to have another glass of wine. That is true, too. Understanding that there are many truths, equally valid, would go a long way to calming the political debate. 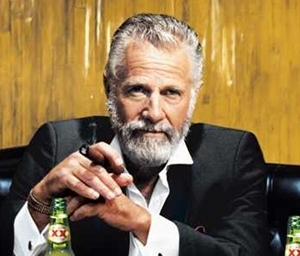 I can only see and hear many people arguing vehemently that there is only ONE TRUTH…and they have it. The delight of delusion. It’s been said that “All stories are Gilgemesh”. It can be entertaining to try to deconstruct all of Western Literature into one sentence. In Lit class I remember the instructor saying, “There are only two stories in the whole world: ‘Someone goes on a journey’ or “A stranger comes to town’. 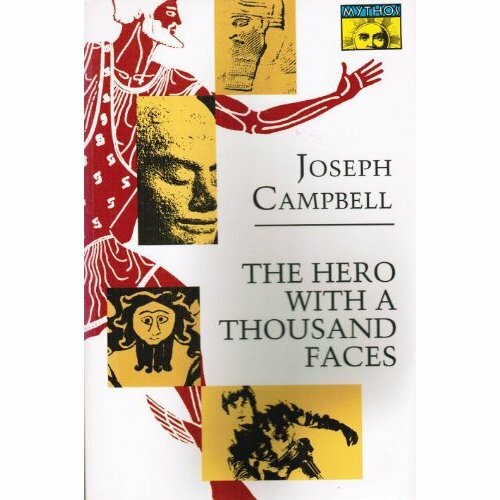 Joseph Campbell’s “The Hero with a Thousand Faces” is a fabulous book exploring the core of storytelling in that vein. The myths and stories of all the humans on earth are explored, their similarities and differences discussed as well as the psychological need humans have to hear stories. Nowadays we have film and computer-generated images to expand our imaginations. Music and light delight the ear as well as the eye and lead us into the world of storytelling. Opera was the big-budget platform for storytelling before technology made music and images available to everyone at the local theatre. When I think of the collective effort that goes into producing a complete Ring of the Nibelung, I am astounded. And of course, it is a live performance requiring the hard work of several hundred people. It is like a battle, I think, getting everyone in their places when the curtain goes up…every note from every instrument, every voice raised in song, every swish of a costume and every flash of dragon-fire or valkyrie cry had to be planned, rehearsed and executed. This is 15 hours of live performance. Not played back to back…but if one opera is given every night for four nights it is still a formidable story-telling extravaganza. Perhaps the biggest and longest in the world. Humans will always tell stories. You know that just by standing at the office water-cooler. The delivery system has changed over the centuries, but the human stories have not. We still want to see evil defeated, the lovers united, and the weak become powerful by overcoming all odds. 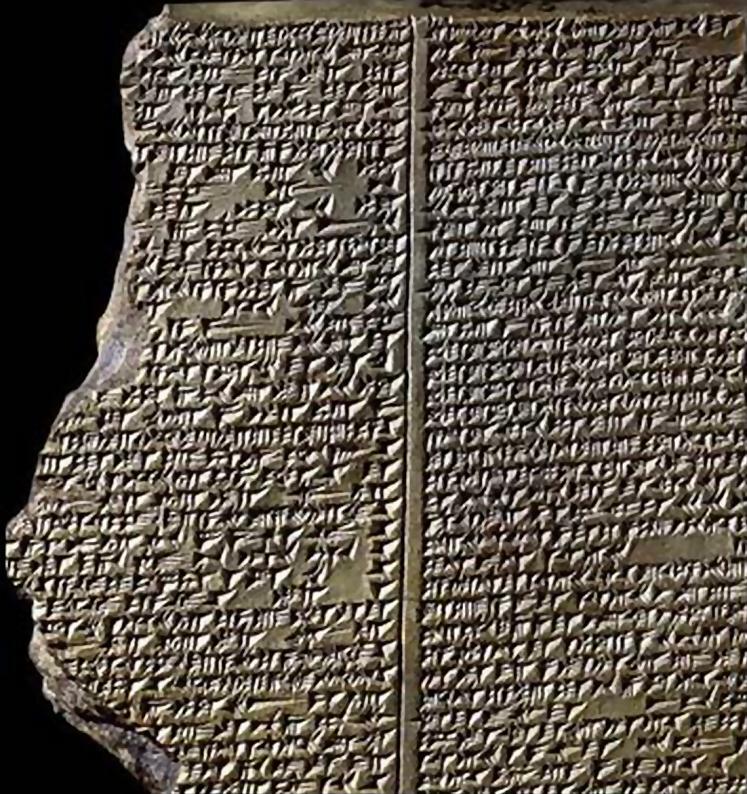 The Epic of Gilgemesh may be 26 hundred years old, but it is still a good story, even today. I am eagerly waiting for the Feature Film. It’s about time. Carl Jung was an important 20th century alchemist, but he did not spend years in a tower with beakers and flasks. The transformation he searched for was within himself. 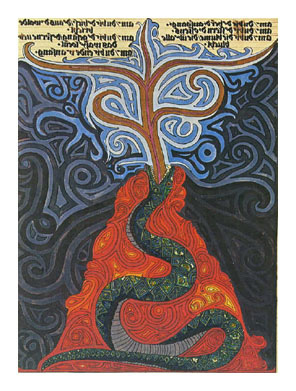 Psychology and Alchemy (Princeton University Press 1980) has been widely available, though not so widely accessible, and in the 21st century his notebook The Red Book was published (W.W. Norton 2009). 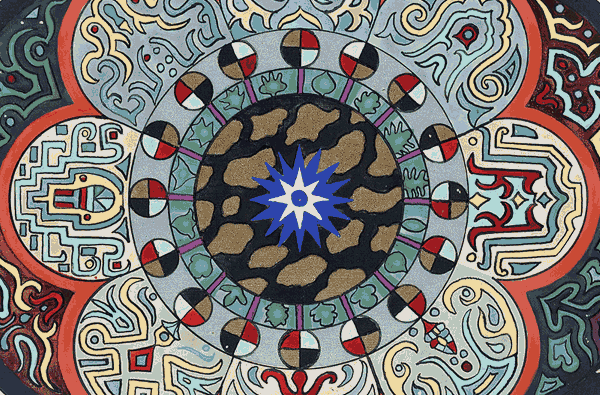 Jung said, “The real mystery does not behave mysteriously or secretively; it speaks a secret language, it adumbrates itself by a variety of images which all indicate its true nature. I am not speaking of a secret personally guarded by someone, with a content known to its possessor, but of a mystery, a matter or circumstance which is “secret,” i.e., known only through vague hints but essentially unknown. The real nature of matter was unknown to the alchemist: he knew it only in hints. In seeking to explore it he projected the unconscious into the darkness of matter in order to illuminate it. In order to explain the mystery of matter he projected yet another mystery – his own psychic background -into what was to be explained.” —Psychology and Alchemy (Part 3 Chapter 2). In the Hermetica of Elysium I tried to show both aspects of the medieval alchemists. 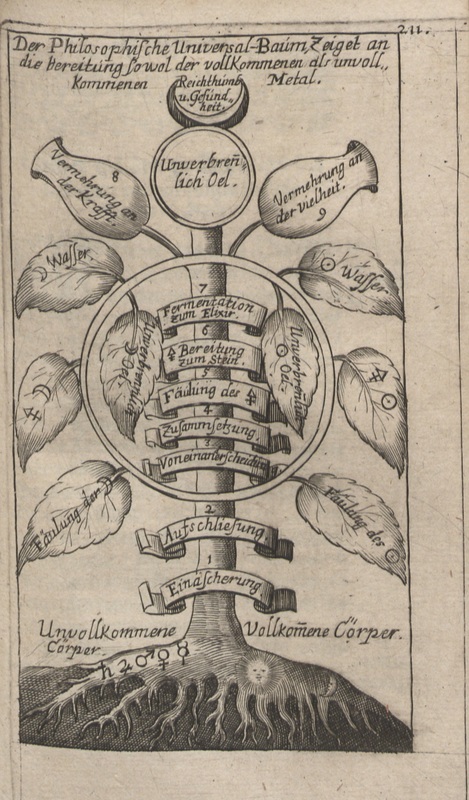 I wanted to describe how the people who were focused on earthly treasure and power sought to gain an advantage over their competitors using any means possible…including maintaining a resident alchemist who was supposed to be working on turning base metals to gold, while at the same time he was really working on discoveries of the mind. This is a fertile field for adventure and excitement…how could a novelist resist? 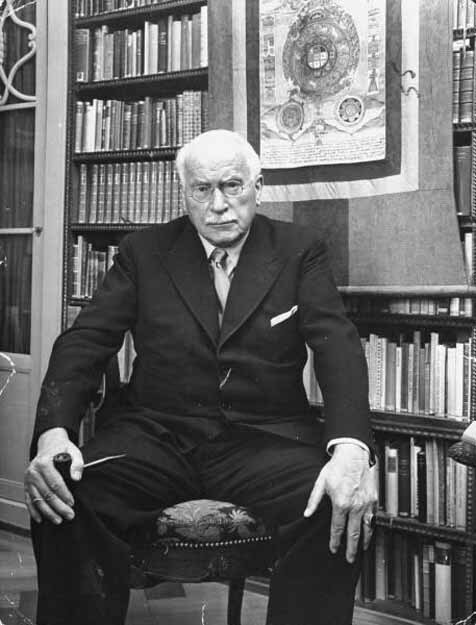 Jung spent years in research, and his collected works would take years to study. His ideas about what it means to be a human being have tremendously influenced the field of psychology. His Synchronicity theories tie in with String Theory and link psychology with theoretical physics in ways that make both psychologists and physicists uncomfortable. Remember, magic is just science we don’t understand. 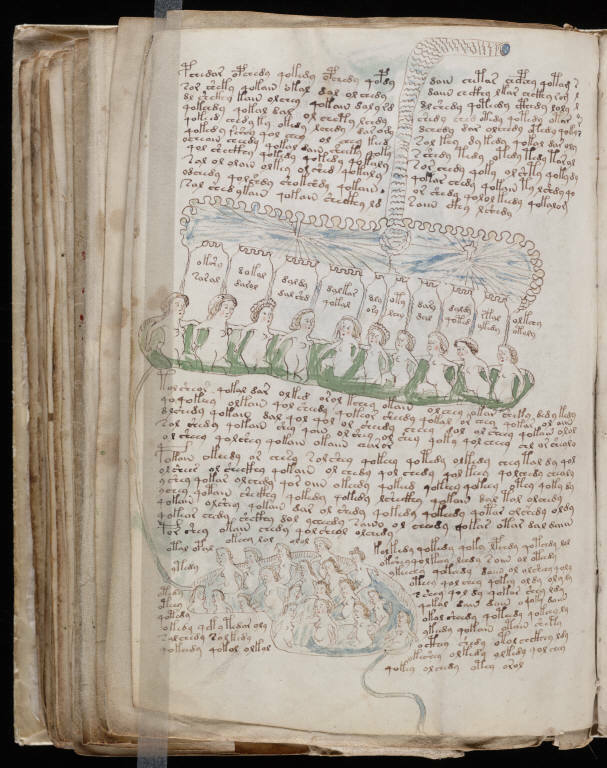 The Yale Beinecke Library has put the entire Voynich online so that everyone can see this fascinating book. It was written in the late 15th and early 16th centuries and was once owned by Elizabeth I’s magician John Dee. 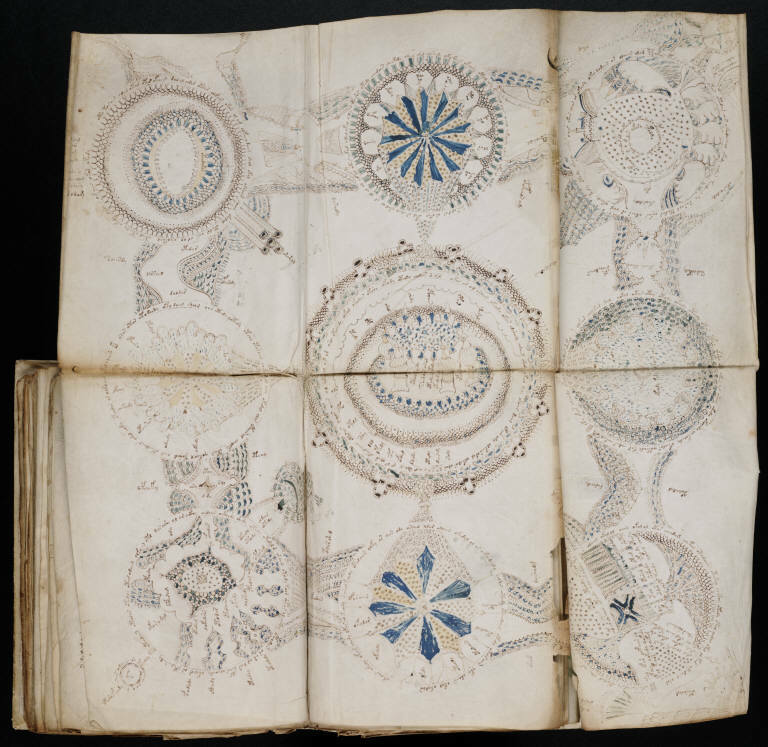 The entire book is in code, and has yet to be deciphered, though many have tried over the years. You can look at the book here. This drawing of many ladies in a cocoon of sorts with tubes leading out of their heads to…well…another place, made me think these plant parts were not being used to cure a cough. Recent studies have shown Nymphaea caerulea to have psychedelic properties, and may have been used as a sacrament in ancient Egypt and certain ancient South American cultures. Dosages of 5 to 10 grams of the flowers induces slight stimulation, a shift in thought processes, enhanced visual perception, and mild closed-eye visuals. Nymphaea caerulea is related to, and possesses similar activity as Nelumbo nucifera, the Sacred Lotus. Both Nymphaea caerulea and Nelumbo nucifera contain the alkaloids nuciferine and apomorphine, which have been recently isolated by independent labs. These psychoactive effects make Nymphaea caerulea a likely candidate (among several) for the lotus plant eaten by the mythical Lotophagi in Homer‘s Odyssey. Used in aromatherapy, Nymphaea caerulea is purported to have a “divine” essence, bringing euphoria, heightened awareness and tranquility. Other sources cite anti-spasmodic and sedative, purifying and calming properties. 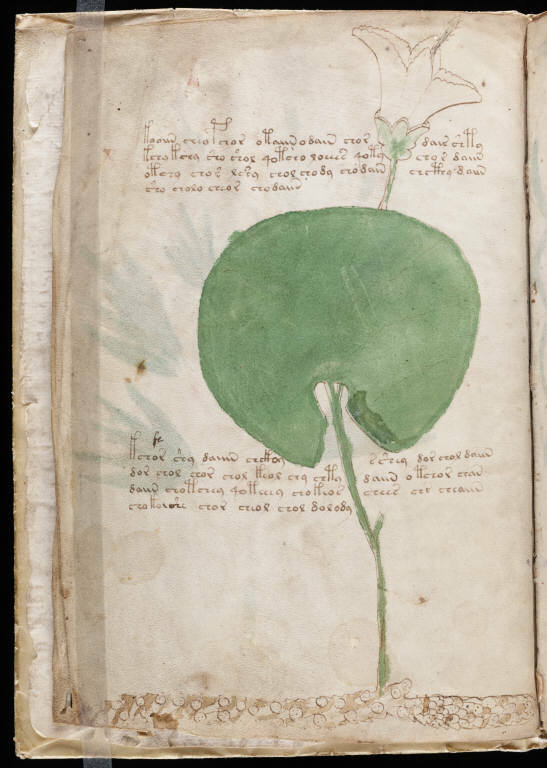 Some of the recognizable plants in the Voynich have similar attributes. 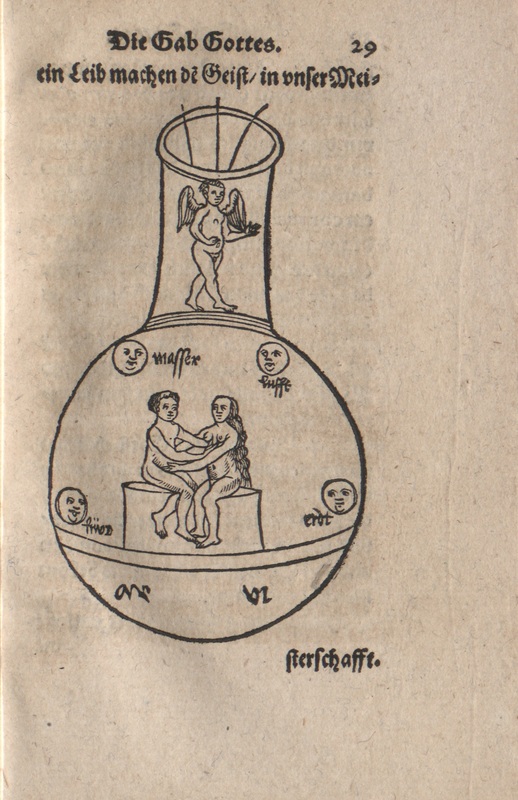 The alchemists made various elixirs for various purposes, we know that is true. 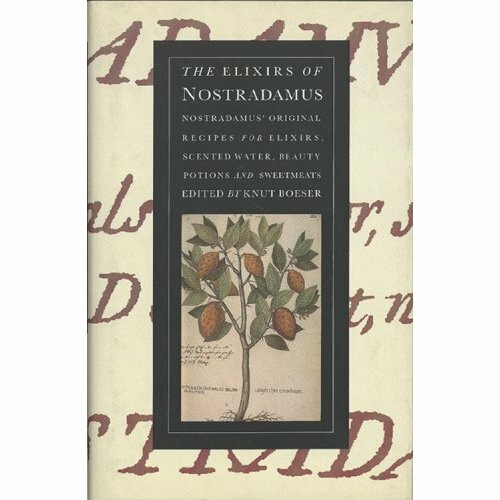 I have a copy of a book called The Elixirs of Nostradamus which is very interesting, though I noticed the text at the end of the book specifically mentioned that some of his more “dangerous” concoctions were not included. Nostradamus travelled somewhere to gather his predictions. His body was in the tower, but his mind was far far away.